Modern seafood processing practices result in amassment of a large volume of waste products, i.e., skin, head, tails, shells, scales, backbones, etc. These waste products may often encompass several high-value products which are still untapped due to the dearth of appropriate management. Moreover, inadequate disposal of waste also has negative implications on both environment and human health. This seafood waste often contains a huge amount of chitin, a polysaccharide that exhibits exceptional inherent characteristics including biocompatibility, biodegradability, antimicrobial, antitumor and antioxidant activities. The present review summarizes the existing methods for recovery of chitin and its derivatives from marine waste. The preparation of chitin nanoparticles was discussed along with blending of chitin and chitosan with other biopolymers. The recent trends of the application of chitin and chitosan nanostructures in various sectors were explored. 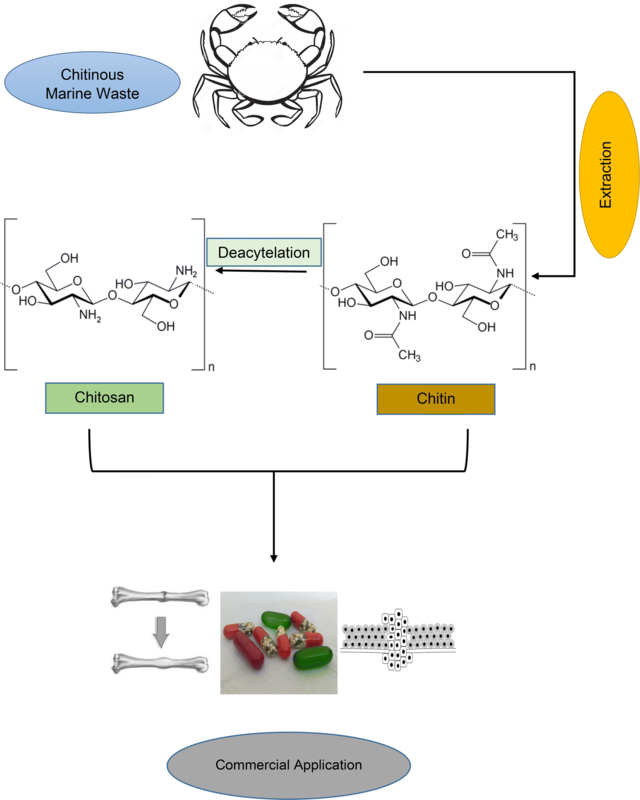 This review is an attempt to highlight the extraction methods of chitin and chitosan from marine waste resources and its transformation into valuable commercial products as a solution to waste management. With growing population, waste generation is also increasing and major proportion of by-products generated by contemporary food remains underutilized which may often contain high-value substances. Crucial problem faced by industries and society during food processing is disposal of food waste. Around 1012–1014 tons of chitin are produced annually by living organisms in ocean (Dhillon et al. 2013), out of which 2.8 × 1010 kg is generated by arthropods in freshwater and 1.3 × 1012 kg in marine environment (Cauchie 2002). This huge quantity of chitin would provide enough raw material, if commercial procedures were developed for extraction of commercially competent polymers. Habitually, seafood waste is burned, land filled, dumped at sea or left to get spoiled (Xu et al. 2013). If not processed properly, it may have a negative impact on human health, biodiversity and environment. Following cellulose, chitin is the second most abundant polysaccharide. Chitin is converted into its deacetylated form, i.e., chitosan on a commercial scale. Chitin and chitosan both have enormous economic value because of their flexible biological properties. Crystallinity and insolubility of chitin demote its commercial applications. Conversion of chitin into derivatives viz. chitosan, chito-oligosaccharides and glucosamine augments its biological properties and applications in agriculture, food, textile, medical and cosmetic industries. Therefore, the focus of the present review is to provide the latest information on the preparation of chitin nanostructures from native resources through chemical and biotechnological processes. The review also highlights the chitin-based nanotechnology applications along with current patents and international projects based on chitin and chitosan. Chitin is the most abundant polysaccharide in the marine ecosystem and second in nature after cellulose. 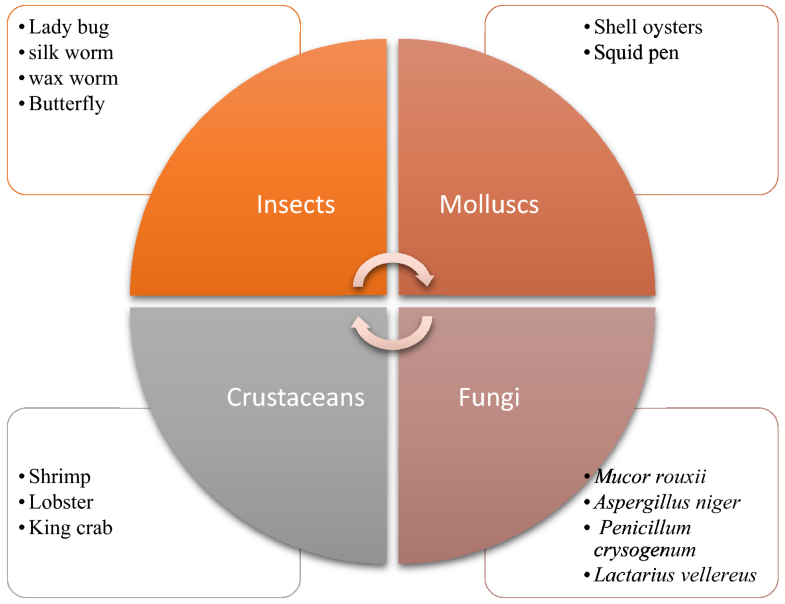 Various sources of chitin in nature have been summarized in Fig. 1. Chitin, in nature, is present in three different types of crystalline forms α, β and γ and varies in degree of deacetylation (Aam et al. 2010). The primary sources of chitin are the crustacean shells obtained from the shellfish processing businesses. These crustaceans include crabs, shrimps, lobsters and krill. 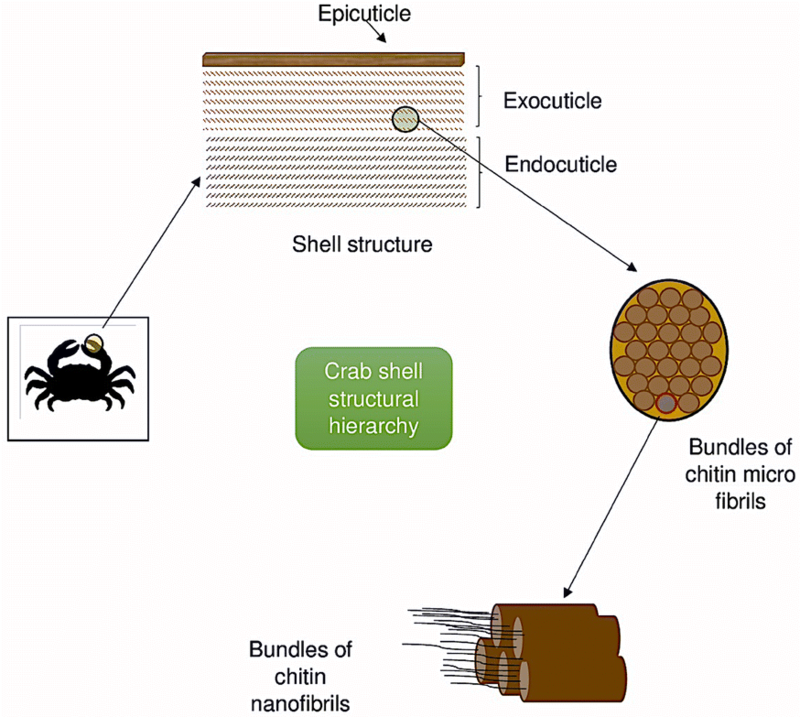 The hierarchical arrangement of chitin fibrils in crab shells has been explained in Fig. 2.
α Chitin is found in yeast and fungal cell wall, shrimp shells, insect cuticles as well as in crab and lobster tendons and shells (Kaur and Dhillon 2014; Merzendorfer and Zimoch 2003; João et al. 2015). In α chitin, polysaccharide chains are arranged in antiparallel orientation which allows maximum bonds. Therefore, α chitin is the most stable form of chitin in nature resulting in chitin fibrils with high crystallinity index (80%). The β chitin is generally found in squid pens and in the tubes synthesized by vestimentiferan worm and pogonophoran. It also occurs in aphrodite chaetae and in lorica produced by some protozoa or seaweeds. In monocrystalline spine, a more pure form of β chitin has been found to be excreted by Thalassiosira fluviatilis, a diatom. In β chitin, polymer chains are arranged in parallel orientation and the crystallinity index of chitin fibrils is around 70%. Higher distance between adjacent polymer chains makes this form more reactive and readily soluble in solvents (João et al. 2015). γ Chitin comprised of combination of α- and β chitin-type orientation in which two parallel polymer chains are arranged alternatively with one anti parallel chain. Chitosan is a linear polysaccharide comprising of deacetylated and acetylated units of d-glucosamine linked by β(1,4) glycosidic bonds. Such polymer is obtained by deacetylation of chitin, where acetate ions and an –NH2 group are produced through hydrolysis of acetamide group. 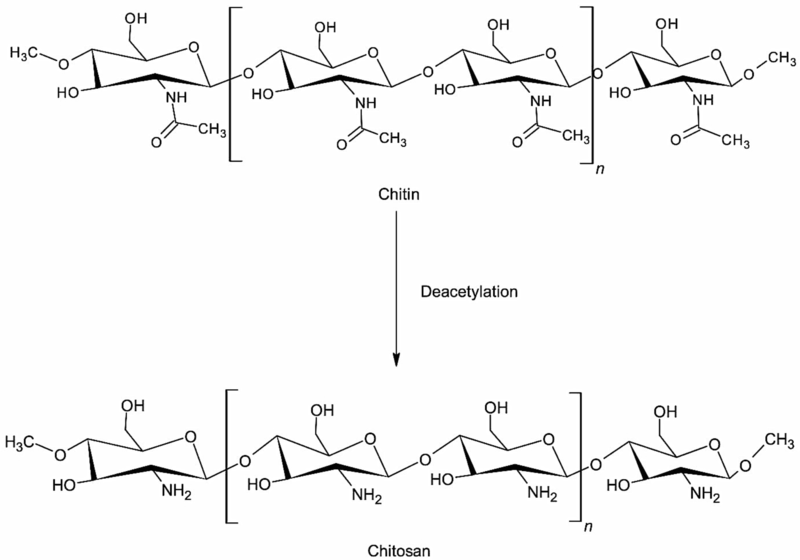 Ratio of glucosamine and N-acetyl glucosamine generally defines the degree of deacetylation in chitosan. The higher N-acetyl glucosamine percent than glucosamine is found in chitin, while glucosamine percent is higher than N-acetyl glucosamine in chitosan (Viarsagh et al. 2010; Ramírez et al. 2010). The degree of deacetylation influences both chemical (tensile strength, solubility, surface area, viscosity, conductivity, porosity and flexibility) and biological properties (adsorption enhancer, biodegradability, antioxidant, bioavailability and biocompatibility) depending on process conditions (Benhabiles et al. 2012; Park and Kim 2010). Chemical structure of chitin and chitosan is shown in Fig. 3. Due to low biodegradation rate, seafood processing industries assemble a large quantity of scrap (Abdou et al. 2008). When dumped into the sea, these lumps of food scraps caused pollution in coastal areas. This marine waste can be exploited as a substrate for chitosan and chitin production. For obtaining chitin, its extraction from natural sources is the most crucial step. The parameters and conditions of extraction regulate numerous characteristics of purified chitin such as molecular weight, degree of deacetylation, purity and polydispersity index. All these characteristics majorly influence the application of chitin in countless realms. Even though chemical extraction is eco-unfriendly and uneconomical process which adversely affects the physical and chemical properties of chitin, and removes minerals and proteins, still, it is the most commonly applied method on commercial scale. However, due to these disadvantages, biological extraction has been recently attracting interest, since it is cheaper and safer treatment for chitin retrieval but limited to laboratory scale only (Dhillon et al. 2013). 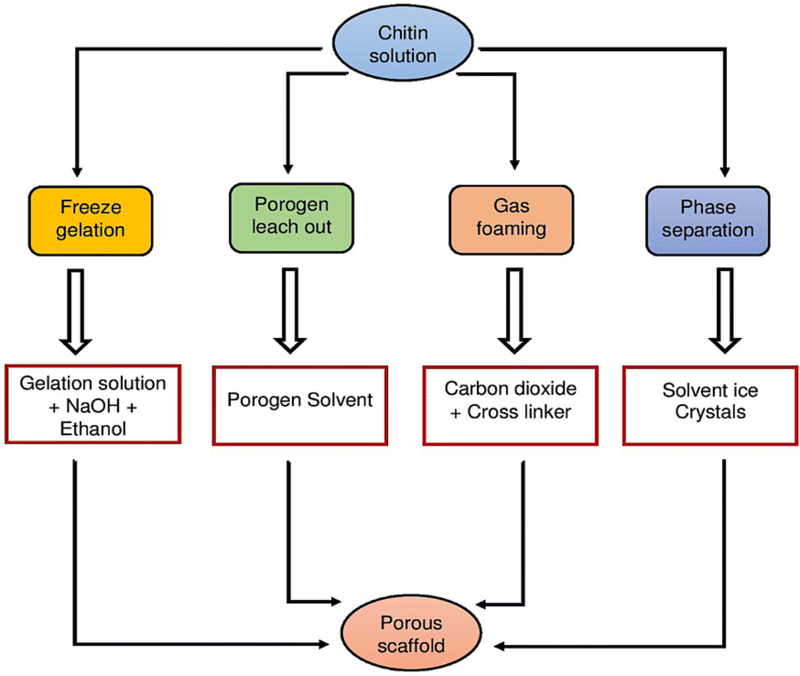 The process of chitin extraction from natural resources and its conversion into chitosan has been outlined in Fig. 4. Shells obtained from diverse sources are subjected to washing and drying followed by crushing into powder (Islam et al. 2004). The chemical extraction methods include three steps: Deproteination, demineralization and decoloration. The deproteination step includes the disruption of chemical bonds between proteins and chitin which involves the use of chemicals to depolymerize the biopolymer. For biomedical use, the removal of proteins is principally important, as the protein content is the chief culprit to bring allergy to the human population. The first approach used in deproteination was chemical method. A wide variety of chemicals were used and tested for their efficiency as deproteination reagents. Though, in each study, reaction conditions differ extensively. At concentrations ranging from 0.125 to 5.0 M, NaOH (a preferential reagent) was employed at varying temperature and treatment duration. NaOH not only leads to deproteination but also results in hydrolysis of biopolymer, dropping of its molecular weight and partial deacetylation of chitin. A decoloration step is an additional step which is required only if a colorless product is desired. An organic solvent mixture or acetone was employed to eliminate pigments like carotenoids (Dhillon et al. 2013; Benhabiles et al. 2012; Abdulkarim et al. 2013; Mohammed et al. 2013). Table 1 illustrates some of the key studies for recovery of chitin from marine resources through chemical (and in some cases combined with enzymatic) method. The development and progress of green extraction processes are centered on the concept of ‘green chemistry’ which is gaining more attention, preferring the application of microorganisms and enzymes for recovery of chitin. Conventionally, chemical extraction process is used for chitin extraction which involves demineralization, deproteination and deacetylation steps using concentrated acids and alkali under high-temperature conditions. 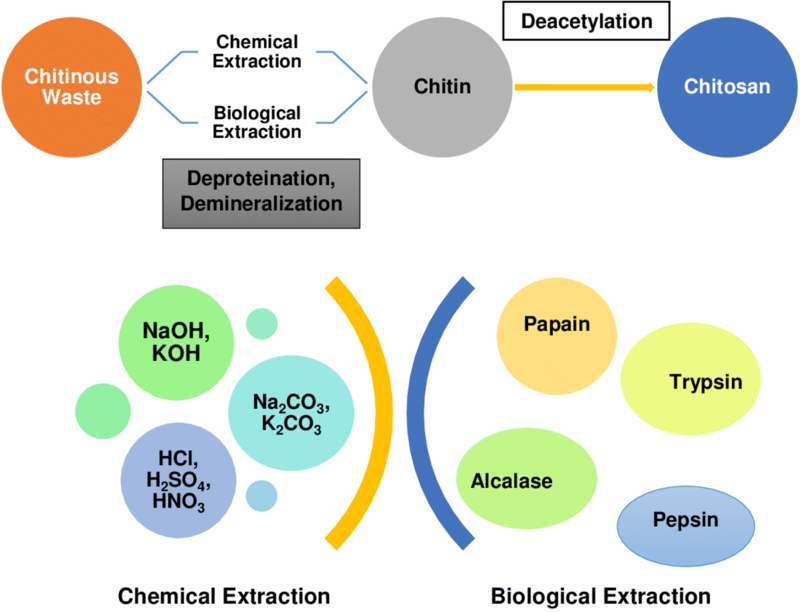 Such process conditions require high energy and are associated with several negative implications such as increase in chitin purification cost and impaired physiochemical properties of extracted product (Dhillon et al. 2013). Therefore, use of biological process for chitin extraction is gaining immense attention as it is cleaner, eco-friendly and economic along with production of chitin and chitosan with desired properties. Khanafari et al. (2008) reported a comparative study on shrimp shells for removal of chitin by biological and chemical processes. The outcomes indicated that the biological extraction process was superior to the chemical method, since it not only preserved the chitin structure but also was eco-friendly. Deproteination of shrimp shells can also be achieved through biological method by employing proteolytic microorganisms. The biological extraction of chitin offers simpler manipulation, lower energy input and greater reproducibility in comparatively less time and solvent consumption (Dhillon et al. 2013). The two most commonly used biological methods for chitin extraction include: (1) Enzymatic deproteination and (2) fermentation using microorganisms (Arbia et al. 2013; Gortari and Hours 2013). Proteolytic enzymes such as proteases are required for removal of proteins during chitin extraction from seafood waste. Plants, animals and microbes are the main sources of proteolytic enzymes. Various proteases like papain, trypsin, pepsin, devolvase, alcalase and pancreatin may be employed to remove proteins from shells and minimize the depolymerization and deacetylation during isolation of chitin. Accessibility for the enzymes can be modified by performing the deproteination either before or after demineralization step. In deproteination step, both crude and purified extracted enzymes can be used. However, purified enzymes are expensive in comparison to crude enzymes. Crude enzymes are mostly obtained from fish viscera and bacteria. Among these, bacterial proteases are more common. In majority of fish producing countries, 50% of by-product represents seafood harvest which is not utilized, discarded and rejected as waste (Rao et al. 1998). Therefore, it could be fascinating to employ crude enzymes for extraction of chitin to lower the cost of the process along with conserving the environment. Various studies have shown the use of bacterial proteases for carrying out deproteinization. Synowiecki and Al-khateeb (2000) carried out enzymatic deproteinization of shrimp waste which was already demineralized to obtain a nutritionally valuable protein hydrolysate and chitin. Though, the enzymatic method is a clean process; however, the efficiency is lower in comparison to the chemical processes as around 5%–10% remaining protein still remained associated with the isolated chitin. Additional NaOH treatment could be used for treating final isolated chitin to increase its purity. In addition, the order of deproteinization and demineralization does not have significant influence on the yield and the quantity of the final chitin product in chemical process (Kaur and Dhillon 2015). By carrying out deproteinization using fermentation method, the price of using enzymes can be reduced by adding selected microbial strains and endogenous microorganisms. Microbial strains can be selected by fermentation which can be single-stage, two-stage, successive fermentation or co-fermentation (Arbia et al. 2013). Fermentation approaches can be categorized into two main classes: lactic acid fermentation and non-lactic acid fermentation. Lactobacillus sp. strain is used for fermentation of crustacean shells which produce proteases and lactic acid. Lactic acid is obtained by alteration of glucose which brings about a decline in pH of silage thereby subduing the growth of spoilage microbes. The productivity of lactic acid fermentation depends on various factors viz. the quantity and microbial composition of inoculum, initial pH, pH progression during fermentation, carbon source and its concentration, temperature and the length of fermentation time (Prameela et al. 2010). Both fungi and bacteria such as Bacillus sp. (Sini et al. 2007; Ghorbel-Bellaaj et al. 2012a, b), Pseudomonas sp. (Ghorbel-Bellaaj et al. 2011) and Aspergillus sp. (Mahmoud et al. 2007) were used for fermentation of crustacean shells in non-lactic acid fermentation. Several aspects were described to affect the fermentation process and thereby deproteinization and demineralization competences (Choorit et al. 2008). Ghorbel-Bellaaj et al. (2011) screened the influence of enzyme–substrate ratio and varying reaction time deproteinization efficacy of protease isolated from P. aeruginosa A2. Table 2 illustrates the studies regarding biological extraction methods for recovery of chitin. 5% (w/v) glucose, initial pH 7, 5 days at 37 °C, 200 rpm. Chitin can be transformed into chitosan by employing enzymatic or chemical method (Tokuyasu et al. 2000; Philibert et al. 2017). Due to suitability for mass production, chemical processes are used commonly for the chitosan production at commercial scale. In chemical method of deacetylation, either alkalis or acids are employed to deacetylate chitin. Since glycosidic bonds are quite vulnerable to acid, alkali is proposed to be a better choice (Hajji et al. 2014). Deacetylation of chitin can be carried out either heterogeneously or homogeneously. In the heterogeneous process, chitin is subjected to exposure with hot concentrated NaOH solution for few hours and an insoluble filtrate of chitosan is obtained in the form of ∼ 85%–99% deacetylated chitin. In the homogeneous process, alkali chitin is prepared after dispersing chitin in concentrated NaOH solution at 25 °C for 3 h. The alkali chitin is then suspended in crushed ice at 0 °C. This process usually leads to production of soluble chitosan with 48%–55% of an average degree of acetylation. After 580 h, this method results in production of chitosan having deacetylation degree of 10% with homogenously dispersed acetyl groups along the chains. Aiba (1991) revealed that under heterogeneous conditions, deacetylation reaction results in an uneven distribution of d-glucosamine and N-acetyl-d-glucosamine residues along the polymeric chains. Therefore, the degree of aggregation and solubility of chitosan may differ in aqueous solutions resulting in alteration of their characteristics. Moreover, distribution of acetyl groups along the polymeric chains, degree of deacetylation, molecular weight and viscosity in solution may change due to difference in conditions of chitosan preparation (Berger et al. 2005). Several factors during the deacetylation reaction can influence the characteristics of resulted chitosan product. Rege and Block (1999) examined the impact of processing time, temperature and mechanical forces on characteristics of chitin. The observations indicated that temperature and processing time were the most significant factors having noteworthy impact on degree of deacetylation and molecular weight. Tsaih and Chen (2003) also studied the effect of temperature and reaction time. All of these studies were carried out using the conventional one-factor-at-a-time approach. These studies specified that molecular weight and deacetylation of chitosan are principally influenced by the concentration of NaOH, temperature, duration of reaction and recurrence of alkaline treatment steps. More studies regarding the conversion of chitin into chitosan have been summarized in Table 3. The enzymatic method of chitosan preparation includes deacetylation of chitin in the presence of chitin deacetylase enzyme. Chitin deacetylase (EC 3.5.1.41) is a member of carbohydrate esterase family and hydrolyzes the acetamido group present in the N-acetylglucosamine units of chitin, thereby generating glucosamine units and acetic acid (Zhao et al. 2010). Enzymatic deacetylation of chitin was investigated with deacetylase isolated from various organisms such as fungi (A. niger, F. velutipes, C. lindemuthianum, M. racemosus, etc. ), insects (Apis mellifera, Drosophila melanogaster, Helicoverpa armigera, etc.) and bacteria (V. cholera and other bacteria of Vibrionaceae family). However, chitin deacetylase was observed to be less effective for natural chitin which is insoluble and crystalline in nature. To enhance the accessibility of chitin deacetylase to acetyl groups of natural crystalline chitin, pretreatment is needed to carry out with physical or chemical methods such as sonication, grinding, heating and derivatization (Zhao et al. 2010). N-Acetyl glucosamine (GlcNAc) is a widely distributed monosaccharide derivative of glucose and the monomeric unit of chitin. Apart from chitin, GlcNAc also constitutes heterogenous polysaccharides such as murein, hyaluronic acid, etc. (Ashry and Aly 2007). GlcNAc molecules and its derivatives with varied functional groups are involved in cell interactions (Chen et al. 2010). For example, GlcNAc is the prime component of H antigen in ABO blood groping and involves in antigen–antibody interaction. GlcNAc is also constituent of many glycoproteins in human such as mammalian growth factor, tissue plasminogen factor, hormones viz. follicle stimulating hormone, thyroid stimulating hormone, luteinizing hormone, human gonadotropic hormone, etc. (Chen et al. 2010). GlcNAc can be extracted using chitin as feedstock through chitin hydrolysis. Chitin hydrolysis can be attained using either chemical hydrolysis or enzymatic method. In chemical method, chitin degradation is performed using a strong acid. The concentration of acid and reaction temperature should be in the range of 15–36% and 40–80 °C, respectively (Bohlman et al. 2004). Conventionally, GlcNAc is commercially produced via acid hydrolysis method. However, the production of chemical waste, high cost and low yield are the limiting factors of chemical method which makes it less desirable. The alternative enzymatic method involves chitinolytic enzymes and the process can be carried out under mild conditions. The chitinolytic enzymes comprise of endochitinases, exochitinases, chitobiase and N-acetylglucosaminidases (NAGases) (Gooday 1990). Endochitinases cleave chitin at internal sites, thereby generating low-molecular weight chitin oligosaccharides (COG), while exochitinases or chitobiases catalyze the progressive release of dimers by cleaving chitin at external sites (Fig. 5). 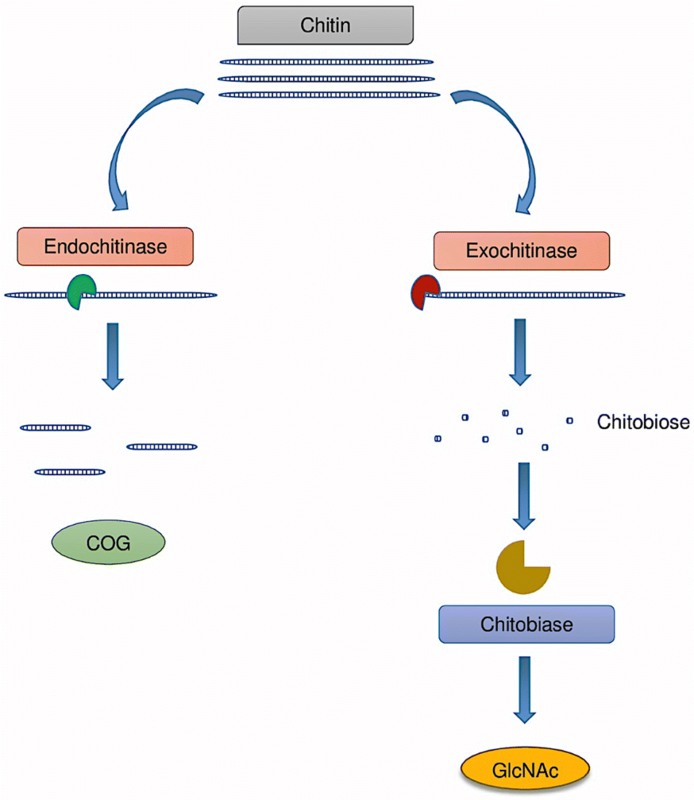 Finally, the dimers and oligomers produced by endochitinases, exochitinases and chitobiases are degraded by NAGase (Lee et al. 1999). Enzymatic hydrolysis can be performed on industrial scale by mass production of chitonolytic enzyme by employing micro-organisms such as Trichoderma hamatum, Trichoderma viride, Aspergillus niger, Carica papaya, Aeromonas hydrophila, etc. (Sashiwa et al. 2001). However, purification of enzymes from fermentation broth will increase the production cost. In the field of nanofabrication, the top–down approach refers to fabrication of a nanostructure from native superstructure of larger size through successive disintegration (Iqbal et al. 2012). Several reports have been published on fabrication of chitosan nanofibers and nanowhiskers by adopting the method of disassembly (Liu et al. 2011a, b; Zhou and Wu 2011). The fabrication strategy was based on wet grinding of chitosan flakes which subsequently followed by homogenization at high pressure. The method resulted in achieving chitin nanofibres with diameter ranging from 100 to 1000 nm. Wijesena et al. (2015) prepared chitin nanofibrils (average diameter of 5 nm) from crab shells using ultrasonic method for mechanical disassembly. Subsequently, chitosan nanofibers were fabricated employing these chitin nanofibers as precursor. Similarly, researchers have also adopted the simple technique of grinding to fabricate chitin nanofibrils from microfibrils (Ifuku et al. 2013). In another study, chitin nanowhiskers and nanofibers were formed by radical assisted oxidation of chitin using 2,2,6,6-tetramethyl piperidine-1-oxyl followed by ultra-sonication (Fan et al. 2009). Tanaka et al. (2014) reported nanofibrillation of chitin powder by bubble formation with nitrogen gas under ultrasonication. Chitin nanofibers are conventionally produced by either top–down approach (breaking down the larger molecules) or by electrospinning of chitin solutions (Kadokawa 2015). Both approaches involve harsh conditions comprising use of highly acidic or basic solutions. However, recent researches focus on alternative environment-friendly approach to produce chitin/chitosan nanofibers by employing self-assembly mechanism. However, chitosan nanoparticles cannot self-assemble from pure chitosan due to its insolubility (Li et al. 2014). Therefore, amphiphilic chitosan derivatives solutions are used for self-assembly of chitosan nanoparticles. Chitosan-based amphiphilic copolymers are composed of hydrophilic and hydrophobic segments which undergo intermolecular association to form micelles (Li et al. 2014). Self-assembly is a cost-effective bottom–up approach without needing vigorous chemical reactions. Figure 6 depicts the comparison of top–down and bottom–up approaches of chitin nanofabrication. Recently, curcumin-encapsulated chitosan nanoparticles were prepared by employing sonication method. Physicochemical parameters such as particle size, zeta potential and drug encapsulation were also evaluated. The results revealed improved solubility of curcumin with sustained release pattern (Raja et al. 2016). The absence of environmental implications and less complexity of fabrication process of self-assembled nanoparticles provide an attractive and economic alternative for conventionally prepared nanoparticles. However, controlling and manifesting desired properties, shape and size is still a challenging aspect. To increase the mechanical properties of chitin and chitosan, they are often combined with PLA (Polylactic acid), PLGA (polylactic–glycolic acid), collagen alginate, etc. These composite biomaterials are processed to form scaffolds, films, sponges, fibers, gels, etc. with better mechanical properties. Table 5 summarizes the studies reporting preparation and application of chitin-based scaffolds blended with other biopolymers. Wang et al. (2008) investigated the bone repair capability of chitin–collagen-based scaffolds and witnessed repair of bone defect sites in rabbit after 12 weeks of implantation. Similarly, scaffolds incorporated with alginate along with chitin increase the vascularization and help in the deposition of the calcified matrix and connective tissue in scaffolds structure. To improve mechanical properties, chitin-based scaffolds were reinforced with PLGA which revealed compressive moduli and strength comparable to the trabecular bone (Jiang et al. 2006). Nasrin et al. (2017) prepared chitin/PLA-laminated composite for implant application. Blending of 5% chitin in PLA revealed improved physical and mechanical properties along with lower water absorptivity and increased antimicrobial sensitivity. Bano et al. (2019) investigated the antibacterial and wound healing properties of glycerol-plasticized chitosan/PVA blends. Results revealed effective wound healing against second-degree burn along with normal growth of epidermis and accelerated connective tissue formation. Similarly, chitin and hydroxyapatite (HAP) composites have shown to enhance the mechanical properties of bone grafting materials, where the compressive strength of scaffolds increases with enhancing the percent composition of HAP in the composite structure. Chitin–polycaprolactone with HAP reported to show enhanced osteogenic differentiation (Arun Kumar et al. 2015). The in vitro osteogenic differentiation study revealed improved expression of bone-specific osteocalcin which is crucial for maturation and mineralization in osteogenic differentiation phases. Antibacterial properties of chitin/HAP scaffolds were also reported which may be attributed to the small size of scaffolds which is able to penetrate and disintegrate the bacterial cell membrane (Shakir et al. 2015). Chitin/Silk/HAP scaffolds were also prepared and reported to enhance new bone formation in human mesenchymal stem cells construct (Lai et al. 2015). Similarly, Zn-doped composite of chitosan and HAP exhibited noteworthy bone healing of rat bone defect within 14 days which indicate the efficacy of HAP in regeneration of bone (Dhivya et al. 2015). Bhowmick et al. (2015) prepared antibacterial macroporous chitosan/polyethylene glycol/HAP/ZnO scaffolds that showed cytocompatibility with osteoblast like MG-63 cells along with antibacterial effect against Escherichia coli, Bacillus cereus and Lysinibacillus fusiformis. Anirudhan and Parvathy (2018) prepared a drug carrier by blending thiolated chitosan and poly-ethylene glycol for releasing insulin. The monitoring of drug release revealed improved drug release profile with no negative implications. Giteru et al. (2019) optimized the preparation of zein–chitosan–polyvinyl alcohol composite by blending the polymers in varying percentage. Optimized film with the highest tensile strength was fabricated by blending 0.35, 0.29, 0.13 and 0.23 (wt%) of zein, chitosan, polyvinyl alcohol, polyethylene glycol, respectively. Chitosan was also investigated as a conduit material for stimulating regeneration of nerve pertaining to its ability to support adhesion and proliferation of nerve cells, i.e., cerebral cortex cells, Schwann cells (Pearson et al. 2003). For nerve regeneration, the scaffolds should be made up of the biomaterial having a low young modulus, so that it can mimic soft nerve tissue. However, chitosan is comparatively more rigid and can compress and rupture the regenerating nerve cells. Therefore, some flexible molecules such as gelatin need to be incorporated in chitosan network before employing it for nerve repair (Cheng et al. 2003). Since pure chitosan-based conduits show the high appearance of inflammatory cells, some proteins or polymers need to be incorporated to reduce the inflammation (Yang et al. 2004; Pfister et al. 2007). Typically, chitosan should be modified by blending of adhesion molecules such as fibronectin, laminins and poly-l-lysine to increase the adhesion, proliferation, and growth of nerve cells which further facilitates the speedy retrieval of nerve functionality. However, the high cost of the adhesive additives limits their applicability. Therefore, collagen was combined with chitosan network of conduit material which showed improvement in nerve repair efficiency as compared to pure chitin-based conduit material (Wang et al. 2009). The differentiation percentage has also reported to be increased by a chitosan–collagen conduit in comparison to pure chitosan (Yang et al. 2009). 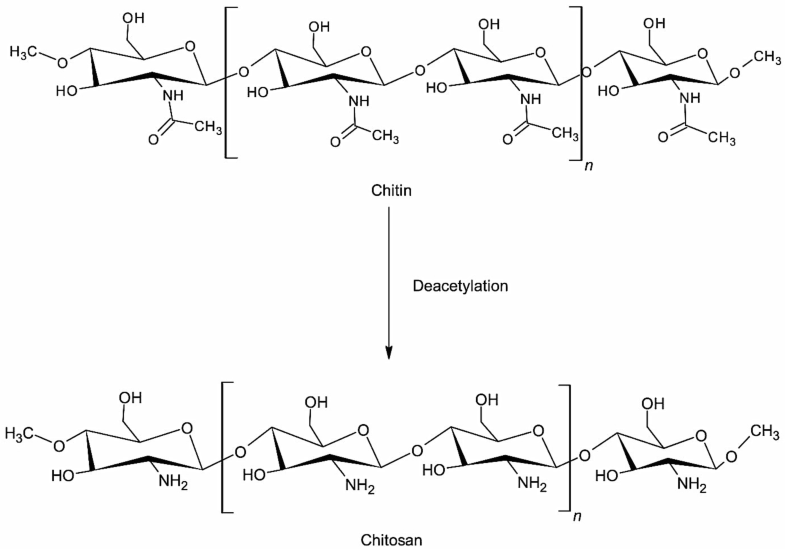 Moreover, chitosan shows slow degradation rate in comparison to chitin which can be modulated by incorporating highly degradable material such as gelatin, collagen, etc. (Yang et al. 2009). Apart from biomedical applications, chitin and chitosan blends were also explored for other applications. Rezakazemi et al. (2018) employed lignin and chitosan blend for removal of methylene blue dye from water effluent. Yin et al. (2018) prepared carboxymethyl chitosan/poly(vinyl alcohol)/Cu blend film for packaging application. The tensile test and thermal gravimetric analysis revealed improved mechanical and thermal properties of chitosan after blending, while the copper ions loading improved the antibacterial activity. Hydrophobic modification of chitin and its derivatives facilitates their self-assembly when immersed in polar solvents (Quiñones et al. 2018). The modification is accomplished by incorporation of hydrophobic chemical entities in the chitin polysaccharide chains. Chitosan modified with deoxycholic acid in such way was suggested as suitable delivery system for DNA transfection (Kim et al. 2001). Hydrophobic modification was carried through carbodiimide via formation of amide bond. The negatively charged DNA and positively charged chitosan nanoparticles resulted in micelle-like nanoparticle vehicle for gene delivery due to self-assembly. Self-aggregated nano-particles in the range of 130–300 nm were prepared by varying the ratio of chitosan and deoxycholic acid along with the molecular weight of chitosan. Wang et al. (2007) prepared chitosan self-aggregates modified with cholesterol and investigated for encapsulating the anti-cancer drug epirubicin. Spherical nanoparticles entrapping epirubicin were ranged from 338 to 472 nm. A slow and controlled release of epirubicin was observed. Another study investigated the encapsulation of retinoic acid in cholesterol-modified nanoparticles of chitosan and observed controlled release. Hu et al. (2006a, b) modified chitosan oligosaccharide with stearic acid for delivery of paclitaxel. Hu et al. (2009) allowed reaction of doxorubicin cis-aconitate with chitosan/stearic acid aggregate to investigate double functionalization of chitosan. The reaction resulted in micelle formation ranging from 40 to 106 nm. Huang et al. (2015) modified chitin whiskers by reaction with bromohexadecane for application in structuring oil. The modified chitin whiskers were observed to remarkable thickening effect by forming stable dispersion in sunflower oil. Duan et al. (2014) modified chitin sponge with deposition of methyl trichlorosilane. The modified chitin sponge was observed to collect organics both on the surface and bottom of the water. It was able to absorb 58 times more than their weight absorption capabilities. Sun et al. (2018) modified chitin surface by employing 2,2,6,6-tetramethylpiperidine-1-oxyl radical with hypochlorite and sodium bromide. The process functionalized the chitin surface with carboxyl groups which enhanced the interaction between chitin and cadmium ions and enhanced the adsorption. Hai and Sugimoto (2018) modified the surface of chitin and chitosan by direct grafting of poly(3-hexylthiophene) through oxidative polymerization. The modified chitin and chitosan surface showcase high hydrophobicity with improved electrical properties. Yan et al. (2018a) modified the chitosan surface with succinyl, carboxymethyl and quaternary ammonium groups and observed the hemostatic properties of modified chitosan. Adapting new approaches and advanced technologies to modernize the governing science and policies is needed call for betterment of humans and the environment. Regarding life science, the most advanced approach is the transitioning of materials from micro-/macro-scale to nano-scale. 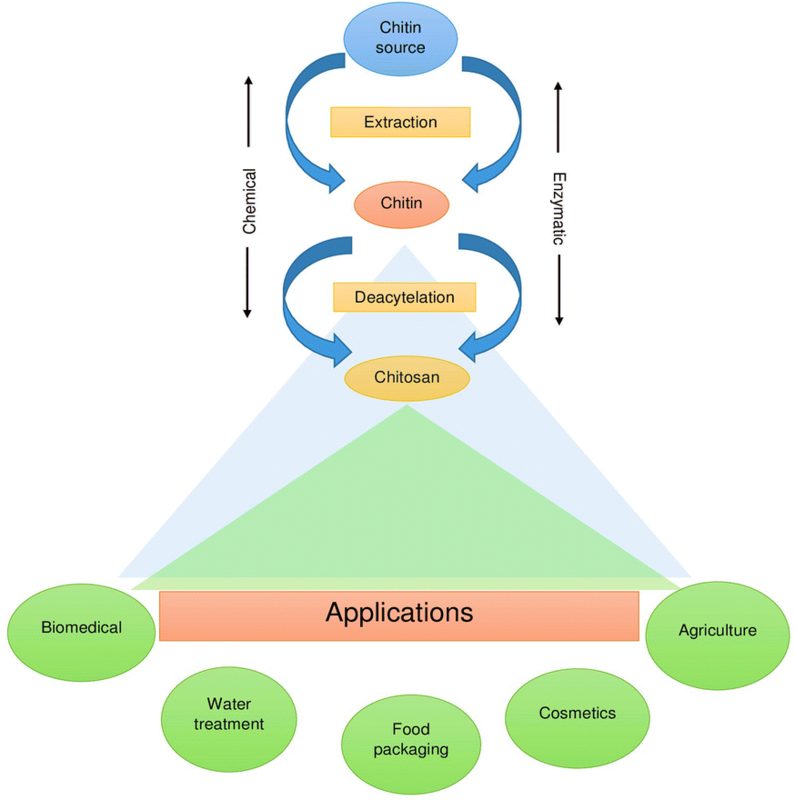 Utilizing chitin and chitosan extracted from waste resources as nanomaterial for various applications can maximize the resource productivity (Fig. 7). Chitin-based nanomaterials are used as carriers for cosmetic ingredients. Morganti et al. (2008) embedded chitin nanoparticles with antioxidants (lutein, melatonin, ectoine) which enhanced the penetration of active ingredients. Combining chitin with antioxidant ingredients also helps to guard the skin from harmful effect of solar radiation due to the scavenging activity of chitin, thereby retarding the photo-aging effects and wrinkles. The chitin polymers are often employed in creams, makeup, lotions, hair care products such as shampoo, hair spray, hair colors and toothpaste, mouthwashes, etc. (Dutta et al. 2004; Gautier et al. 2008). Morganti et al. (2012) combined chitin nanofibrils with hyaluronic nanoparticles to improve the antioxidant activity of chitin. In vivo study was conducted for 60 days on 60 women suffering from photoaging after evaluating the safety concerns on keratinocytes and fibroblasts culture viability. Chitin nano-fibrils can be employed as a reinforcing material for synthesizing biodegradable nano-composites as scaffolds for tissue engineering (Morganti et al. 2008; Mincea et al. 2012). To regain or enhance functionality, some tissues or organs are required to be repaired or replaced by implanting tissue substitutes in the body. 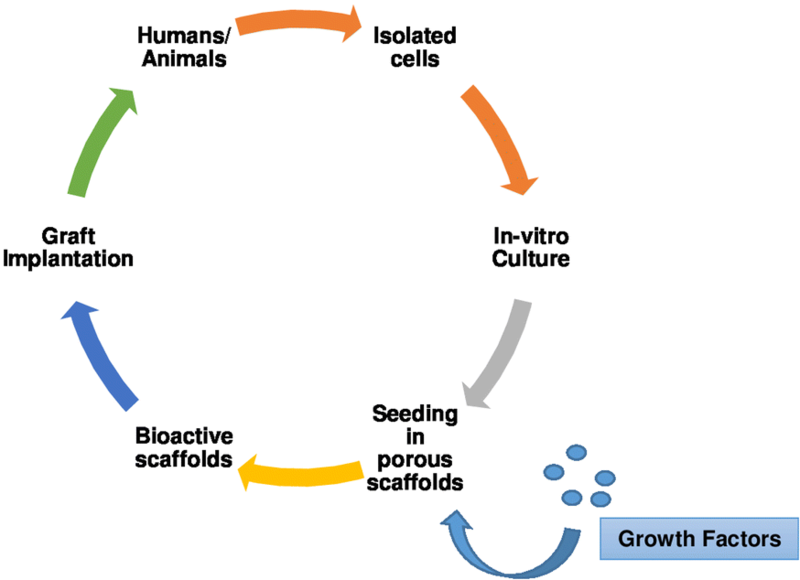 Tissue engineering process involves regenerative of new tissue growing on biomaterials acting as scaffolds in the presence of bioactive molecules such as cytokines and growth factors (Fig. 8) (Ribeiro et al. 2017). To receive appropriate outcomes, the scaffolds must be designed with proper architecture to trigger a desirable cellular response from targeted organ (Keeney et al. 2012; Agarwal et al. 2013). If the structure of scaffolds is comparable to the native extracellular matrix of the human body, it increases the cell adhesion differentiation and proliferation. Fabrication of scaffolds can be done by employing multiple methods such as gas foaming technique, particulate leaching technique, phase separation and lyophilization method, freeze gelation method, etc. (Fig. 9). In gas foaming method, gas bubbles are generated by mixing agent with pre-polymer. In an alternate method, polymer can be saturated at high pressure with subcritical and supercritical gas. Depressurization leads to bubbles growth which generates pores when the gas bubbles escape the solution (Levengood and Zhang 2014). Supercritical carbon dioxide is the most frequently employed for production of porous scaffolds. In freeze gelation method, the phase separated is subjected to sodium hydroxide or ethanol exposure at − 20 °C to induce gelation of chitosan. In phase separation method, chitosan solution made in acetic acid is introduced in mold and allowed to freeze. Ice crystals formed in solution after freezing are phase separated. The subsequent freeze drying step leads to formation of porous scaffolds pertaining to sublimation of ice crystals. In particulate leaching method, a porogen such as paraffin, gelatin, etc. is mixed with chitosan solution and subsequently leached out resulting in porous scaffold. Another form of chitin, chitin whiskers also have a broad range of possible applications in biomedical field for preparing renewable and biodegradable nanoparticles and nanocomposites (Usman et al. 2016; Pangon et al. 2016). Pourhaghgouy et al. (2016) prepared nano-composite scaffolds of chitosan reinforced with bioactive glass using freeze casting method. Concentration of bioactive glass ceramics was varied from 10 to 50%, where fourfold increase in compressive strength was observed for 50% concentration. Moatarya et al. (2017) prepared chitin–chitosan–nanodiopside composite scaffolds by employing freeze drying technique and reported enhanced swelling and degradation properties. The cytocompatibility was analyzed and no significant toxicity was observed. Silica derivatives such as SiO2 nanoparticles are incorporated in chitin/chitosan matrix to induce biomineralization. Lee and Kim (2016) performed in vivo study to investigate the healing properties of such SiO2-incorporated chitosan membranes in rats for recovering critical calvarial defect. The resultant improvement in healing process can be attributed to the accelerated osteoblast function induced by SiO2 nanoparticles. Chitin-based environmentally sensitive smart drug delivery systems can be employed for site-specific controlled drug delivery based either on pH or temperature sensitivity. Being immensely hydrophilic in nature, chitosan can always be cross-linked and blended with other biodegradable polymers to yield desirable release rate of drugs. Recently, chitosan nanoparticles were employed to encapsulate levofloxacin for treating ocular infection and observed to be non-irritant for ocular administration (Ameeduzzafar et al. 2018). In another study, a polyelectrolyte complex formulated by combining chitosan and carboxylic curdlan was employed for delivery of 5-fluorouracil (Yan et al. 2018b). Recently, chitosan has also garnered attention as vaginal delivery of peptide–based vaccines and microbicides for treating sexually transmitted diseases (Marciello et al. 2017; Shariatinia 2019). Chitosan can also be blended with PLA, PLGA, collagen, alginate, etc. for delivery of antibiotics, chemotherapeutics, anti-inflammatories, immunosuppressant, antipsychotics, vaccines, DNA, siRNA and proteins (Yang et al. 2009). Ding et al. (2015) coated chitosan with Fe3O4 nanoparticles as delivery system for anti-cancer drug 5-fluorouracil. Though activated carbon is still the first and foremost choice as adsorbent for waste water treatment, the low-cost and eco-friendly green adsorbent material prepared from natural resources is gaining attention. The ever increasing demand of fabricating sustainable and environment-friendly bio-based products from natural resources has further boosted the intensive research to shift towards green bio-adsorbents. Recently, cellulose and chitosan have been suggested as appropriate replacement for activated carbon as absorbents to remove impurities from waste water (Olivera et al. 2016). The presence of functional groups such as hydroxyl and amino group further makes chitosan more alluring as absorbent to remove metal pollutants and pesticides (Dehaghi et al. 2014). Several studies have investigated the efficacy of chitosan nanostructures for absorption of lead, chromium, cadmium, arsenic, acid green 27 dye etc. (Qi et al. 2004; Hu et al. 2006b; Seyedi et al. 2013; Sivakami et al. 2013; Kwok et al. 2014). Raw native chitosan has been reported to have maximum adsorption capacity of 10 mg/g which is comparable to the adsorption capacity of activated carbon (10.3 mg/g) (Pyrzynska 2019). Combining chitosan and activated carbon in nanocomposites was reported to enhance the adsorption capacity as high as 52.63 mg/g (Hackbarth et al. 2015). Solid supported materials such as magnetic nanoparticles and bentonite were also reported to enhance the adsorption capacity of chitosan for removal of cadmium (Ahmad et al. 2015; Demey et al. 2018). Modification of chitosan surface with quaternary ammonium bromide was also reported for removal of heavy metal ions (Zhang et al. 2016; Shekhawat et al. 2017). The surfactant-modified chitosan beads prepared by Pal and Pal (2017) enhanced the adsorption of cadmium ions threefold as compared to pure chitosan. The composites of chitosan with other biopolymers were also explored for dye removal application. Composite hydrogels of chitosan, rectorite and cellulose were investigated by Tu et al. (2017) as dye absorbents for Congo Red. Kyzas et al. (2015) prepared chitosan grafted with carboxylic groups and investigated their ability to remove zinc and cationic dye. Chitosan grafted with succinyl group revealed improved absorption and simultaneous removal of Zn and Remarcyl Red dye from wastewaters. A membrane filtration system equipped with chitosan nanoparticle-coated membrane was investigated for its water purifying ability. The multiple tube fermentation test revealed maximum elimination of coliforms (Rajendran et al. 2015). Chitosan composites blended with zinc oxide nanoparticles were reported to remove almost 99% of color pollutant present in the textile industry effluent (Abul et al. 2015). The antimicrobial activity of chitin and its derivatives can be explored to designate them as food preservative that slows down the microbial deterioration of foodstuff (Barikani et al. 2014; Sethulekshmi 2014). Chitosan addition to cheese was investigated to analyze its effect on cheese deterioration (El-Diasty et al. 2012). The shelf life was reported to be extended by inhibiting the growth of yeast and molds. Apart from being served as a food preservative, chitin and chitosan are also employed as antimicrobial coating and packaging due to the antimicrobial properties they possess. Fruits, vegetables, grains, fish, etc. can be coated with biofilms of chitosan that provides a protective barrier from microbial attack thereby preserving the nutritional quality of food (Aranaz et al. 2009; Sinha et al. 2014). Biopolymeric films of chitin in combination of other antimicrobial compounds such as bacteriocins, antibiotics, fungicides, chelating agents, plants extracts like thymol and cinnamaldehyde can also be employed to improve the shelf life of food by reducing food spoilage due to microorganisms (Dutta et al. 2012). The edible and biodegradable chitosan-based films used for food packaging can also be consumed along with packaged food. Chitosan-based derivatives such as hydroxypropyl chitosan (HPCS) and diethoxyphosphoryl polyaminoethyl chitosan also possess antimicrobial activity similar to chitosan. Deng et al. (2013) immobilized nanofibrous mat with HPCS through electrospinning method and added organic rectorite to enhance the antibacterial activity. The prepared HPCS-based nanofibrous mats revealed superior antibacterial activity against E. coli and S. aureus. Fan et al. (2018) investigated the antifungal properties of diethoxyphosphoryl polyaminoethyl chitosan derivatives against P. capsici, F. solani, and B. cinerea. Both multi-aminoethyl groups and phosphoryl groups resulted in improved antifungal activity of chitosan. Chitin- and chitosan-based food packaging products are manufactured and supplied worldwide. ChitoClear®, a chitosan-based product for food packaging, is commercialized by Primex Company (Siglufjordur, Iceland). NorLife and Kitoflokk™ brand from Norwegian Chitosan (Kløfta, Norway) also manufactured for application in food and beverages (Ferreira et al. 2016). Chitosan and its derivatives have been stated to exhibit antitumor activities both in vitro and in vivo (Tokoro et al. 1988). The in vivo investigations demonstrated the inhibitory effect of chitosan on tumor cells as an outcome of stimulation in T-lymphocyte proliferation arisen by the elevated secretion of interleukins. Chitosan was also reported to stimulate macrophages which suppressed the growth of tumor cells in mice (Nishimura et al. 1986). Several reports advocate the antitumor activity of chitosan, even when it is administered orally. Oral administration of chitosan along with diet at 1 mg per kg of dose resulted in decrease of tumor growth in the liver by 62% (Guminska et al. 1996). The antitumor activity of chitin and its derivative reportedly depends on the structural characteristics of chitin derivative (molecular weight and the degree of deacetylation) as well as the type of tumor cells. Jeon and Kim (2002) investigated the impact of varying the molecular weight of chitosan on the growth of uterine cervix carcinoma 14 (U14) and sarcoma 180 (S180) and revealed that the antitumor activity of chitosan increases with decreasing the molecular weight. Other researchers examined the impact of varying molecular weight on tumor cells in terms of cytotoxicity and observed no difference with changing molecular weight. However, better activity was observed with increasing the degree of acetylation in chitin derivatives (Younes and Rinaudo 2015). Apart from chitin and chitosan, GlcNAc is also known to possess antitumor activity. The study conducted on tumor-bearing mouse model has reported to show significant tumor growth suppression after oral administration of GlcNAc (Masuda et al. 2014). Realizing the unique features and a wide range of potential applications of chitin, various international projects have been initiated in past decade in coordination with commercial sector to further explore the capabilities of chitin to dominate on industrial scale. This section summarizes some of the key projects initiated in this direction such as CHITOCLEAN, n-CHITOPACK and BIOMIMETIC project. The CHITOCLEAN project coordinated by Austria was initiated for purification of polluted drinking waters by employing the holistic approach of water treatment based on chitin-based biosorbents which are known for their excellent absorption capabilities. The project demonstrated the power of chitin-based materials to remove the low-concentration pollutants. In this project, the water filters were created by employing shrimp and crab carcasses for domestic-scale applications as well as large-scale applications. The project partners also investigated regeneration and recycling of chitin-based materials to enhance the working life of the filters. In addition, the effect of these filters on mineral contents of water was also investigated along with the methods of disposing the old filter material. New chitin-based biosorbents were found to show more adsorption properties in comparison to old original chitin-based materials, specifically for fluorides and nitrates (CORDIS 2018). The n-CHITOPACK project coordinated by Mavi, Italy was initiated with the objective of developing new chitin-based food packaging material by utilizing chitin nanofibrils with other natural polymers (Morganti 2013). The projects targets towards finding the materials having bacteriostatic properties, 100% biodegradability, comparable mechanical properties with existing packaging materials. The strategy employed by Mavi was focused on developing new industrial applications of patented chitin nanofibrils raw materials for preparing biodegradable food packaging which were earlier limited to cosmetic products and medical devices. The project analyzed user’s requirement through survey as well as analysis of market. The scientific analysis of chitin nanofibrils revealed the efficacy of chitin naofibrils for food packaging as well as safety (CORDIS 2018). The project was initiated in 2012 and coordinated by Procter & Gamble, Italy. The project tried to mimic the enzymatic processes utilized by marine organism to develop bio-mimetic products. For example, the ability of mussels of showing strong surface adhesion in aqueous environment can be employed by conjugating the biomass-based precursors with chitin nanofibrils to develop biobased detergents, cosmetic products, etc. Despite a fair number of published studies on chitosan-based drug delivery systems, FDA has not approved any chitosan-based product for drug delivery. The currently available commercial products based on chitin and chitosan are summarized in Table 6. BST-Gel® manufactured by Piramal Healthcare Canada Inc is a patented chitosan-based self-forming hybrid composite. The self-forming composite consists of two components—liquid (chitosan) and solid (minerals) which admixed to form an injectable pre-gelled paste. This paste eventually turns into gel-like biomaterial in situ. The product finds application in chronic wound healing, cartilage repair, etc. (Chaput and Chenite 2014). ChitoFlex® PRO manufactured by Tricol biomedical Inc is also a hemostatic dressing material to control severe bleeding which also provide antibacterial activity for a wide range of pathogens (McCarthy et al. 2014). The dressing material is a freeze-dried chitosan product which forms adhesive material after coming in contact with flowing blood and adheres to tissue surface. Slim MED™ manufactured by Kitozyme consists of combination of non-animal chitosan and vitamin C. In acidic stomach conditions, chitosan binds with the fatty acids and forms chitosan lipid complex which get excreted thereby reducing the absorption of lipid in body (D’huart and Dallas 2004). Similarly, Liposan Ultra® is a chitosan-based dietary supplement manufactured by Primex, Iceland. Liposan Ultra® traps the fat and oil consumed in diet and reduces their absorption (Johnson and Nichols 2000). There are some companies such as West Pharmaceutical Services, Inc. which are running trials for chitosan-based drug delivery products also. Still, more studies related to clinical trials of chitosan-based drug delivery systems with appropriate precautions are required to get approval from FDA. Talymed® is a wound dressing material manufactured by Marine polymer technologies. It is an advanced bio-active matrix designed for healing the wounds including venous ulcers, diabetic ulcers, pressure ulcers, surgical wounds, second-degree burns, etc. Protasan™ is a water-soluble chitosan glutamate salt manufactured by NovaMatrix. It may be used for a wide range of in vitro and in vivo applications including drug delivery, wound healing, bandages, artificial skin, plaque inhibitor, etc. Reaxon® is a nerve guide manufactured by Medovent to replace bone autografts. This chitosan-based nerve conduit is resistant to collapse and prevents nerve compression and sensitivity disorders caused by autografts. The electrostatic forces between the positively charged Reaxon® and negatively charged cell components support the nerve repair actively. Being the second most abundant polymer after cellulose, chitin can be readily obtained from crustacean shells waste viz. crabs, shrimps, lobster, etc. and has a huge potential to meet consumer needs in various commercial sectors. However, use of harsh chemicals in extraction methods often results in the production of polymers with variable properties viz. size, molecular weight, charge, and degree of acetylation/deacetylation. Therefore, greener and cleaner processes, i.e., biological extractions need to be designed for extracting chitin by minimizing the amount of irregular by-products. Moreover, recovery of polysaccharides, proteins, minerals and pigments from these wasted by-products is also an appropriate solution to maintain ecological balance along with economical gain. Appealing characteristics of chitin and derivatives attract great deal of interest from scientific community to explore various paradigms of industrial applications where chitin can improve quality of existing conventional materials and services. Versatility of applications ranging from biomedicines, textile, food, pharmaceuticals to cosmetics made chitin a lucrative way to channel waste from marine food processing industry into valuable products. Despite potential of providing outstanding properties for commercial purposes, the industrial application of chitin in various sectors is still limited due to issues regarding optimization of mechanical and biological properties according to intended application. Therefore, intensive research is required for designing and optimization of processing methods of chitin into various forms and possible reinforced materials for controlling properties in desirable range. With wide range of potential applications in biomedical field as well as other commercial sectors, chitin-/chitosan-based materials are expected to create major breakthroughs and new prospects for economic growth and development and health. The biological method for extracting chitin from seafood waste is a cost-effective and green process as no chemical is used compared to the chemical extraction. However, the biological method requires time and controlled fermentation conditions such as initial pH, temperature, active culture, type and concentration of supplements, type and concentration of carbon and nitrogen sources, inoculum size, etc. Microbial contamination of the products obtained from biological extraction methods is another important aspect. Moreover, there is a lack of single-stage extraction process for obtaining pure chitin product as in most of the fermentation processes, the product contains large amount of protein which comes along with the deproteination process. It is further stated that the removal of this residual protein may be performed by chemical method. Chitin/chitosan derivatives are promising candidates as biomaterials for wound healing, tissue engineering and drug delivery applications. Being fabricated from freely available natural resources, these biomaterials can be economically more feasible as compared to the synthetic polymer materials. Furthermore, their application in biomedical sector such as scaffolds for tissue engineering saves the cost and manpower required for a second surgery to remove them (as chitin/chitosan materials are biodegradable). The biocompatibility of chitin/chitosan materials also prevents the requirement of any treatments due to sensibility or rejection of implants fabricated from employing these materials. However, there are still many challenges regarding control of mechanical and physical properties of these materials. For nanomaterial application, potential risk of acute and chronic toxic effects is foremost challenge to face. Therefore, future chitin-based biomaterials must accomplish tissue regeneration with simultaneously reducing immune responses and chances of infections. MY, PG developed the manuscript. KP, MK reviewed and corrected the manuscript for grammatical and syntax errors. NP provided scientific and technical comments to enhance the quality of manuscript. VV reviewed the manuscript and provided scientific inputs. All authors read and approved the final manuscript. MY and KP thank MNIT Jaipur for scholarships and facilities. VV acknowledge the Department of Biotechnology, Ministry of Science and Technology (No. BT/RLF/Reentry/04/2013) Government of India for financial support. The data presented in the manuscript were reviewed and concluded from the earlier reported studies and mostly presented in the form of text. All the figures in the manuscript have been drawn by the authors themselves. The Department of Biotechnology, Ministry of Science and Technology Government of India supported this work financially (No. BT/RLF/Reentry/04/2013) provided to VV.